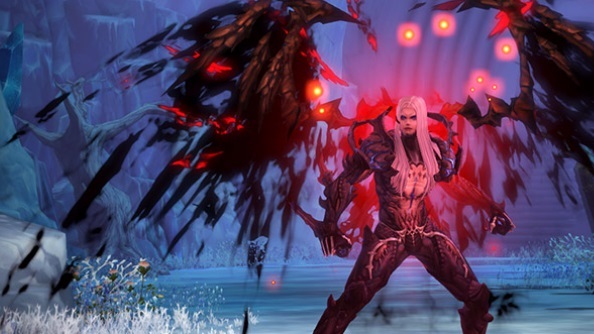 Trion’s latest MMO venture is Devilian, a Diablo-inspired ARPG with a bit of a devil on its back. I mean this quite literally: your character can transform from a squishy human into a powerful, murderous demon. We were introduced to Devilian earlier this year with a hands-off demo, but the game is now in alpha testing phase. I took a character for a spin to explore the opening areas of the world. Like Diablo, Devilain’s approach to art is gothic and tinged in horror, but there’s a distinct eastern flavour here. Characters are ornate and wrapped in flappy cloaks and coats, with heads of swooping hair. Weapons glow bright and produce exaggerated effects with each hit. The men have abs defined with more grooves than a ‘70s disco hall, and the women barely managed to get dressed this morning. Yes, this is definitely one of those games. 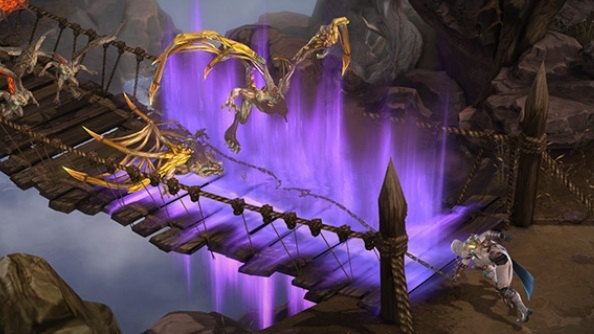 Upon arrival at the starting coastal village of Windbrook, everyone recognises you as a Devilian, despite you not being able to take on your devilish form until several levels later. That doesn’t mean you’re not ready to bash some monsters’ faces in, though. The combat sticks to tried-and-tested ARPG values, with a hotbar of skills that can be assigned to number keys and left/right mouse. Cooldowns vary greatly between the swift and truly ponderous, and skills are quickly unlocked through very swift level progression. My character is a Shadow Hunter; a ninja-like class able to hurl multiple shurikens and attack from range with a chain whip. Battle involves the expected gangs of various grotesque enemies, and feels significantly a game of crowd control. As a Shadow Hunter you have access to a great sweeping chain-spin attack that insta-kills standard enemies in a single whip. Survivors can then be picked off by filling the screen with shurikens and using single-target stabs. 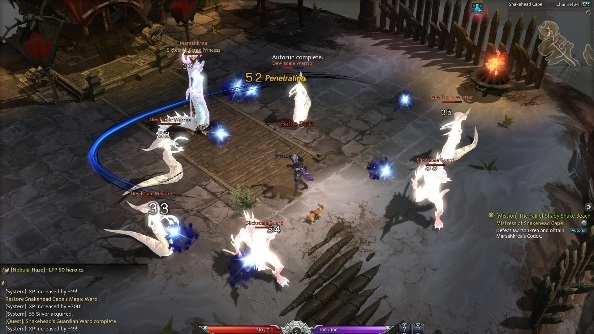 The speed of combat doesn’t feel quite as fast as that of Diablo, and attacks don’t link into each other with that frantic sense of flow, but the moves are entertaining. Your strengths can be augmented with a Talisman, which are rare collectable art cards dropped by bosses (or eventually crafted). They come with special buffs, and can be leveled up to become increasingly powerful the more you use them. Think of them like the stat boosts you’d typically see on enchanted weapons in RPGs, but applied directly to your character. After a couple of hours you unlock your Devilian form, which doesn’t change combat as much as you’d hope. Whilst dishing out notably more damage, the devil inside you doesn’t feel massively more powerful, which means they don’t exactly change the tide. The main difference is the manner in which they attack: my Devilian is a dual-dagger wielding close combat creature, a far cry from my whip-swinging Shadow Hunter who likes to keep far back. They compliment each other: when crowd control fails and too many enemies get close, morphing into my alternate form means I’m suddenly much better in a fist fight. You can’t outright rely on your Devilian though. To summon it, you need to build a meter by killing enemies. The moment you’ve got a bit of juice in the meter you can morph, but you’ll have precious seconds of use. The fuller the meter, the more time you have, but it’s still not a permanent combat solution. If you can already envision yourself enjoying the game’s double-sided combat, you’ll want to sign yourself up for the beta. If you require more of a hook though, you’d best move on to new ground. It may be an RPG, but world building and mission design isn’t Devilian’s forte. Interestingly, this feels intentional: NPC quest givers are brief when passing on instructions, and multi-part quests don’t require you to keep returning to characters to pick up the next chapter. Instead characters call ‘call’ you on the Soul Link, the fantasy answer to the cell phone. This lets you accept and conclude quests when on the go, and keeps you out in the world fighting rather than hanging around uneventful town hubs. The other interesting feature Devilian sports is ‘autorun’. 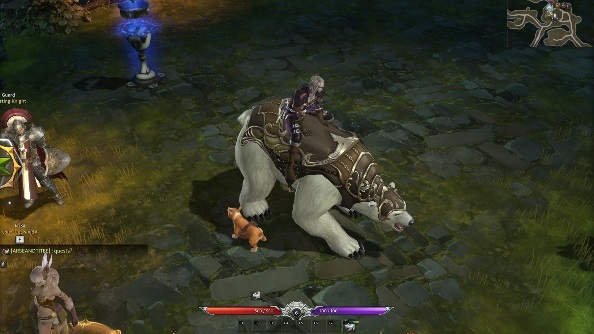 By your quest log entries is a little button that, when clicked, causes your character to saddle up on their mount (a lumbering armoured polar bear) and automatically run to the next objective. It doesn’t work in dungeons, but in the overworld using it means you can simply jump from combat encounter to combat encounter, and during the downtime between you can check Twitter while your character does the boring stuff for you. Is this an elegant solution to a genre problem, or just a quiet admission that things could probably be more exciting? The answer is almost completely down to personal preference. Since Devilian is currently in alpha the player numbers are still quite small, meaning I’ve yet to truly see the game in action as an MMO. Flitting between battles with a second player feels fun and natural though, and the age-old truth that anything is more fun in co-op certainly applies here. When things escalate to beta level, and more players join the servers, it will be interesting to see how things feel as part of a larger group. Perhaps the fairly standard combat becomes an anime-like explosion of colour and blood-spurts with several players ganging up together. To play in the alpha, you’ll have to pay the ridiculous $149.99 price tag on the Obsidian Founder’s Pack. The lower-priced packs guarantee access to the upcoming beta. Your most sensible option would be to sign up here, and patiently await a free beta invitation.